Wolf Commercial Real Estate, a leading Southern New Jersey commercial real estate brokerage firm with expertise in South Jersey commercial real estate listings and services, now has available South Jersey industrial space for sale at 3477 Haddonfield Road and 3450 Saint Martin Road Pennsauken NJ. This Southern New Jersey industrial space for sale features 7,040 square feet of industrial space in Pennsauken in two separate South Jersey industrial buildings for sale. The Pennsauken industrial space for sale at 3477 Haddonfield Road Pennsauken NJ offers 4,200 square feet of industrial space in South Jersey. The industrial space in Pennsauken at 3450 Saint Martin Road Pennsauken NJ provides 2,840 square feet of South Jersey industrial space for sale. The asking sale price for this industrial space in South Jersey at 3477 Haddonfield Road Pennsauken NJ and 3450 Saint Martin Road Pennsauken NJ is $675,000. These South Jersey industrial buildings for sale are available for sale with 30 days notice to Wolf Commercial Real Estate, a Southern New Jersey commercial real estate broker that specializes in South Jersey commercial real estate listings and services. 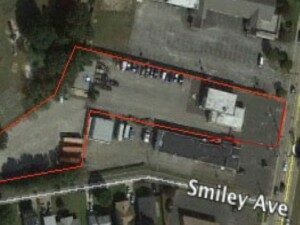 These South Jersey industrial buildings for sale sit on approximately 1.3 acres. This Pennsauken industrial space for sale offers outdoor fenced and gated secure storage. This Southern New Jersey industrial space for sale is perfect variety of uses. Pylon signage along Haddonfield Road is available at this industrial space in Pennsauken. The industrial space in South Jersey at 3477 Haddonfield Road Pennsauken NJ and 3450 Saint Martin Road Pennsauken NJ is located minutes from Routes 38, 70, 73 and I-295 and is in close proximity to the Betsy Ross and Tacony-Palmyra bridges. Parking is abundant at this Pennsauken industrial space for sale through Wolf Commercial Real Estate, a Southern New Jersey commercial real estate brokerage firm with expertise in South Jersey commercial real estate listings and services. More than 268,000 people reside within a five-mile radius of this Southern New Jersey industrial space for sale. The average household income in this same area near this Pennsauken industrial space for sale is $87,718. For more information about this South Jersey industrial space for sale at 3477 Haddonfield Road Pennsauken NJ and 3450 Saint Martin Road Pennsauken NJ or about any other South Jersey commercial properties for sale or lease, please contact Leor Hemo (856-857-6302; leor.hemo@wolfcre.com) or Jason Wolf (856-857-6301; jason.wolf@wolfcre.com) at Wolf Commercial Real Estate, a Southern New Jersey commercial real estate broker.